The Balance certainly makes a good impression coming out of the box. Available in black or white, it uses a sleek, minimalist design, with a glassy surface interrupted only by the Polar logo and an easily legible LCD display. Although we worry that the surface could be prone to smudges or even cracks if it's abused, it seems durable enough, and the Balance is such attractive hardware that it elevates the look of any bathroom. 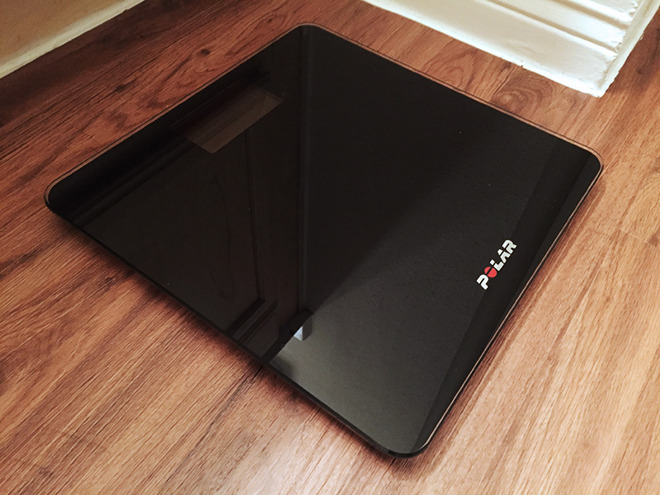 The scale is powered by three AAA batteries, which should last up to 12 months with daily weigh-ins. Weight is measured in either pounds or kilograms, and up to 10 different people can be recognized. Immediately, one limiting factor of the scale is that its "smart" functions are enabled through sync with Bluetooth devices, rather than a Wi-Fi connection. The latter tends to be faster and more reliable, and could theoretically allow the Balance to stand alone, pushing data directly to the Web. On the other hand, users can pair the device not just to a phone, but to one of several Polar fitness trackers including the Loop series: the A360, the M400, and the V800. This makes it possible to sync weight without having a phone handy, though ultimately you'll still want to transfer that data to a phone or computer. People without a Polar wristband are dependent on the company's Flow mobile app. Here the sync process is a little awkward —requiring you to go into a submenu, and time when you step on the scale with when you tap on a measurement icon —but it's forgiving and eventually becomes second-nature. The only significant problem we found is that if you go this route, you can break the scale's pairing with a Polar band. The app —partly mirrored on the Web —is actually one of the most interesting elements of the Balance package. 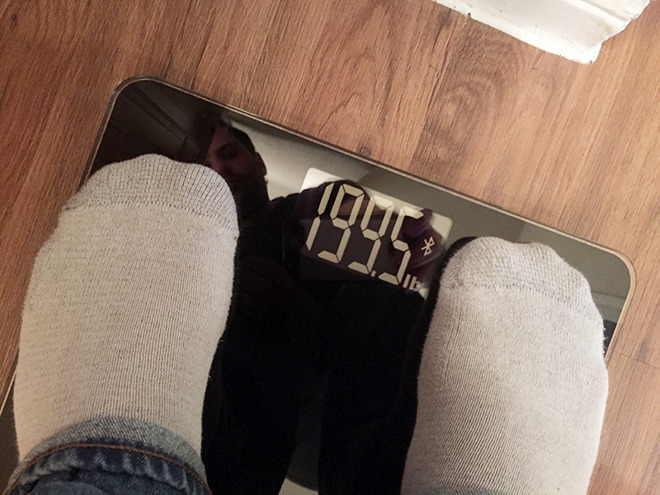 Its interface not only graphs weight trends and BMI, but offers a quick glimpse at the rate of progress, indicating whether your weight is changing rapidly enough and by how many calories you need to adjust. On that note, it should be mentioned that Polar assumes you're trying to lose weight, rather than intentionally put it on. Weightlifters or chronically underweight people may be annoyed by this, although it shouldn't be any serious obstacle to them. 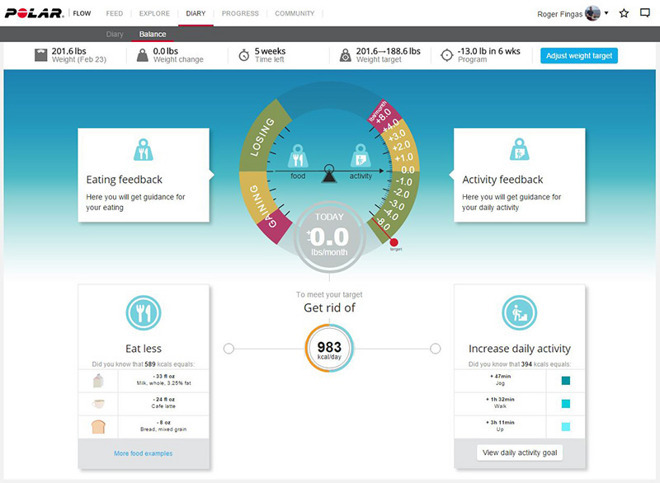 Unlike some fitness apps, Flow will also offer specific recommendations on how to reach a weight loss goal, for instance displaying the calorie impact of cutting certain foods from a diet, or suggesting how long to run or walk. 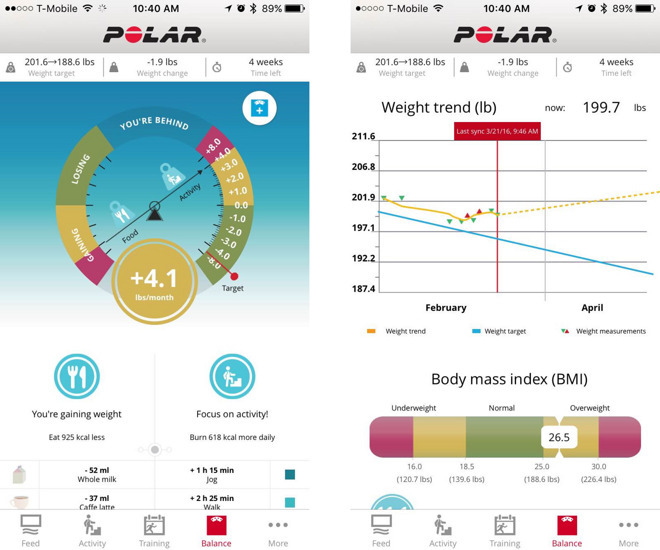 Combined with a Polar fitness tracker, this can potentially offer a comprehensive fitness system, or at least one comprehensive enough for non-athletes —crucially, a recent update let Flow share weight data with Apple's HealthKit. Still, it would be nice if it could cater to people interested in gaining weight, for instance by recommending foods with high protein and low sugar. If there's a serious concern with the Balance it's just that the full benefit is reserved for people willing to go all-in on Polar. Hooks with HealthKit and MyFitnessPal notwithstanding, you'll need to use Flow on a regular basis, which doesn't accept step or heartrate input from rival devices (including the Apple Watch). It's hardly the end of the world —but if you're not intrigued by Polar, there's little reason to pick the Balance instead of something tailored to another ecosystem. One possible motivation is price. At $99.95, the Balance is cheaper than some competitors, which is something that can't be ignored if you appreciate what it has to offer. It sacrifices features like bodyfat tracking in the process, but that's notoriously difficult to do accurately with a scale anyway. The Balance feels like a positive first step for Polar, and worth buying now if it ticks the right boxes. Simply adding Wi-Fi and fixing a few gaps in Flow would make a follow-up very easy to recommend. The Balance is available for $99.95 from B&H and Amazon.com.